I am an equal opportunity reader. That means I will read anything (fiction, really don’t like nonfiction)I can get my hands on. I do have some genre’s that I read less of and assassin thrillers are in that group. My grandfather used to read them all the time when he was alive and then pass them onto me with the words “Jolie, dear, I think you will like this book”. Of course I would read it, actually, struggle to read them. They were so dry and full of technical terms that I would never understand because the authors weren’t kind and didn’t include a glossary at the end. Then I would go to his house and we would talk about the book. As he got older, the less he read and then came the day where he stopped reading (he had dementia among other things) and we stopped discussing books. I accredit him for my deep love of reading and I have a strong feeling that he would have loved Paladine. 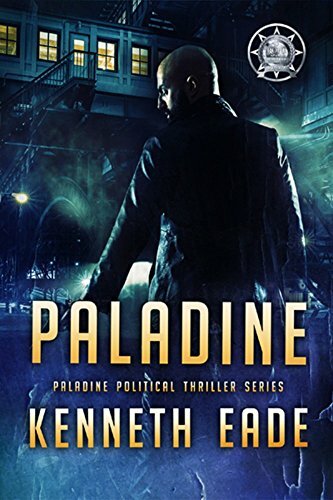 Surprisingly, I really liked Paladine, even though it is not what I usually read. One, this book is definitely not dry. Two, the author kindly has a glossary at the end. I did actually did a fist pump when I realized this (and got a look for BK but pfft to him). The plot was pretty fast paced and it definitely kept you on your toes as to what Robert would do next. Which is what I need in these types of books. I also like that Robert’s character really didn’t have any morals. Sure, he shoots a would-be terrorist through a window a McDonald’s but he really didn’t do it because it was right. He did it because he was in the right place at the right time. Same goes for all of the other terrorist killings. He only did it because he was being paid to do it. But he embraced the nickname Paladine, that a blogger gave him. Reluctantly, but he embraced it. I also like seeing Robert evolving during the book. He went from someone who didn’t need family/friends to someone who missed having social interaction. I thought the scenes with the dog were sweet and added some humanity to him. The action in this book was intense. It was a little gory but I wasn’t expecting it to be nothing less. I also like that the author wrote from the police/FBI/CIA point of view too. But what I really liked was that even people in those departments were like “he’s doing our job for us, let him be”. On the other hand, you had people on the opposite end and who were willing to go all out to try to get him. Why: A fast-paced, thought-provoking book. A little violent, a little gory but if you read these types of books, you need to expect it.